Marco Rubio might not consolidate the establishment lane. 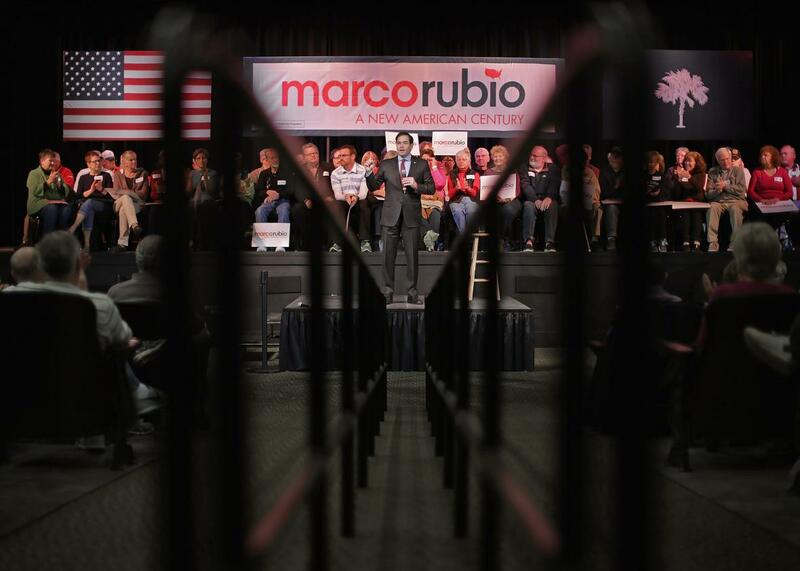 Marco Rubio speaks at a campaign town hall meeting on Feb. 11 in Okatie, South Carolina. It makes sense that Rubio would think this. If you combine the primary votes received by the so-called “establishment lane” candidates—Rubio, Bush, John Kasich, and Chris Christie—this year, that Franken-candidate would have squeezed out a win in Iowa by 2 points over Cruz, coasted to victory in New Hampshire by nearly 10 points over Trump, and bested the field in South Carolina by more than 5 points. Even in a year defined by anti-establishment anger, there appear to be more than enough voters willing to pull the lever for an establishment-minded candidate to deny Trump or Cruz the Republican nomination. This isn’t a new phenomenon. A Fox News poll taken at the end of July, for example, found that Bush’s fans were more likely to name Trump as their second choice than anyone else in the field—and vice versa. In a world where a not insignificant slice of the electorate can imagine themselves switching their allegiances between a political scion who plays by the traditional rules and a first-time candidate who refuses to bow to even basic decorum, it stands to reason that Republican voters can’t be so neatly divided along the establishment/anti-establishment axis that the political press corps (myself included) likes to use to sort the candidates. Rubio, meanwhile, was always the outlier in the party-approved foursome that emerged at the end of last year. The Florida senator is far more conservative than Bush, Kasich, and Christie, and has far less political experience than the three governors. If you’re a voter who liked Bush or Christie for their record, it’ll be easy to find something to like about Kasich but it’s unclear what you would find inherently attractive about Rubio. Marco’s biggest selling point is the perception that he’s best suited to win the general election—a category he seems to be winning by losing on the topics that have so far defined the Republican primary. Yes, Rubio stands to benefit more than anyone else in the race by Bush’s exit, but it’s far from certain that he’ll benefit enough—especially if it remains a three-man race for the foreseeable future. That said, Rubio really does have good reason to cheer his former mentor’s departure. Republican governors and lawmakers who had remained on the sidelines out of respect for the Bush family are now free to back Rubio, as many are now doing. Those endorsements, in turn, could serve as a signal to some of the now candidate-less voters about who they should choose next. And while Rubio won’t pick up all of Bush’s votes, he will likely pick up many of his donors—and, at the moment, it’s the money that may be the more important of the two. Over the weekend, Rubio reported having only $5 million on hand to start the month, far less than the $13.6 million in Cruz’s campaign bank account and Trump’s effectively limitless resources. With multicontest dates on the horizon, Rubio will need an influx of cash to stay competitive with his two main rivals. And even if a few of Bush’s deep-pocketed friends decide to stay on the sidelines, the simple fact that Jeb is no longer running means that his super PAC will no longer be spending tens of millions of dollars trying to tear Rubio down. He’ll still need to fend off Kasich’s attacks from the center, but for the first time Rubio will be able to focus most of his attention on the fire coming from his right. All that may be enough to convince Republican voters that Rubio’s not just their best choice, but their only one. Right now, though, too many Republican voters still believe they have other options.